Neglecting your feet can lead to constant aches and pains, so perhaps it's time you gave your feet the attention they deserve. 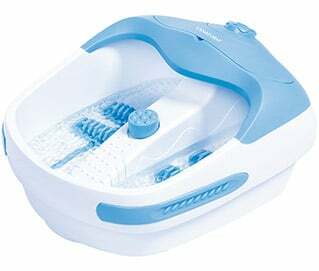 Why not spoil yourself with a beautiful hydro massage using the Lanaform Bubble Footcare Bath? Boasting a series of detachable massage rollers and acupressure points, this luxurious foot spa guarantees you a nurturing massage every single time. It comes with pedicure accessories so you can give your feet a little makeover before or after your spa session. Energizing bubbles and invigorating vibrations rejuvenate the aching and tired soles of your feet for a second-to-none spa and massage experience to relieve daily stress and pain! Your feet need you! So stop neglecting them and treat them to the Lanaform Bubble Footcare Foot Bath. Stylish and slick, the foot spa will look smart wherever it resides in your home.